Is it cool to have pancakes on a Thursday night? I'm thinkin' that's a big, fat yes because... pancakes. They are just the perfect anytime food, whether it's day or night, hot or cold, am I right? Whisk together flour, flax seed, brown sugar, baking powder and salt in a large bowl. In a separate bowl, whisk together yogurt, milk, egg, 2 tablespoons butter and vanilla. Whisk wet ingredients into the dry ingredients, just until combined. Allow to rest for a few minutes. Cut apple into thin slices. Turn cast iron skillet on medium-high heat. Add remaining butter. Once melted and sizzling, add apple slices, turning after 30-60 seconds, until apples are slightly browned on each side and tender. Remove from skillet and set aside. Turn cast iron skillet to medium heat. Add two ¼ cup scoops of batter into skillet. Place one fried apple slice on top of each pancake. When pancake batter starts to bubble and the bottom side is browned, flip. Allow pancakes to cook for about one more minute; remove from the pan and set aside. Repeat this step until pancake batter is gone, adding a little fat in between batches, if needed. 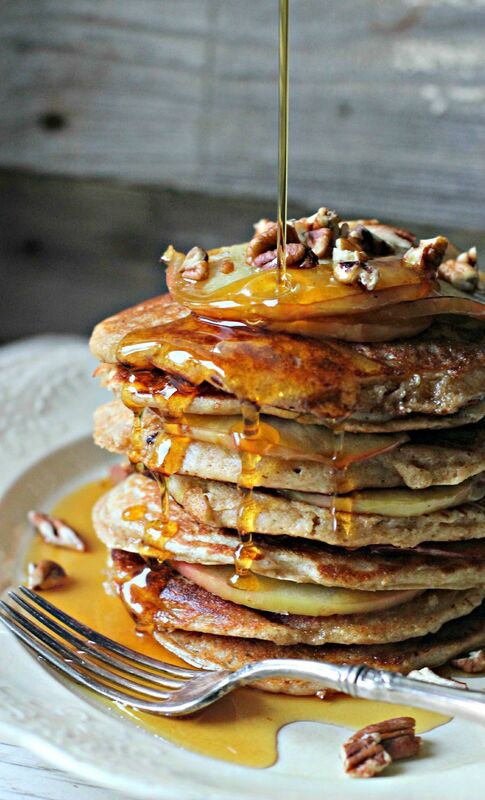 Top pancakes with pecans and maple syrup.